I was in Orvieto, Italy looking at the many colorful sights when I saw this bicycle leaning against the wall. It blended well with the scene and even seemed like a decorative object. 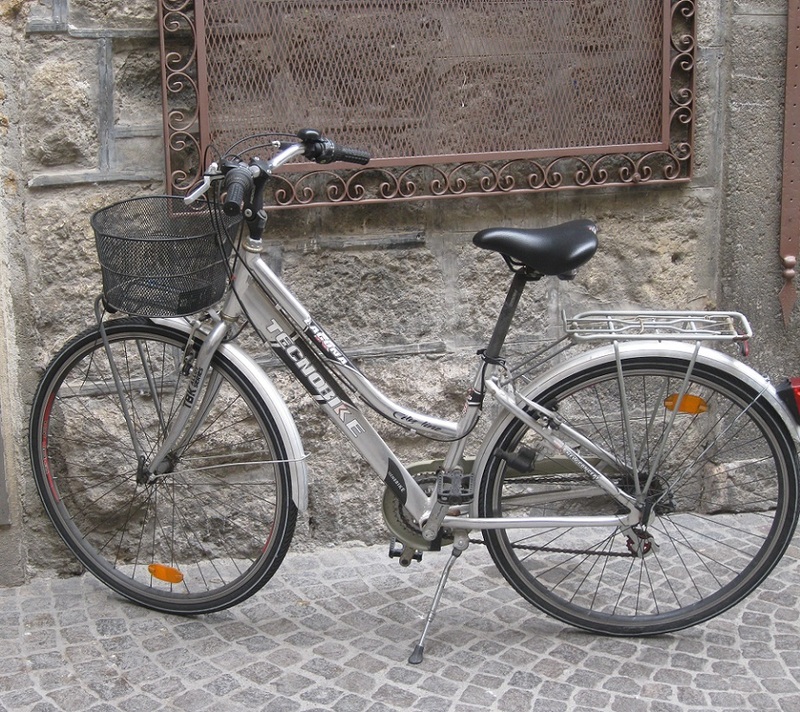 This entry was posted in Italy, Orvieto, Travel and tagged bicycle, postaday. Bookmark the permalink. That’s a lovely photograph, Meg, I like all the textures, it’s full of interest. Thank you Lorna! The walls and buildings were just as interesting as all the shops. Orvieto is one of my favorite small towns… Love this photo! Thanks Amy – I thought that Orvieto was very charming too! That’s a beautiful shot! My sister and I stayed in Orvieto, using it as a home base to explore the area, and it was very lovely. I loved the bumble bee stripes on the Cathedral there! Thanks so much Naomi – you must have had a marvelous visit to Orvieto! Thanks and I agree that a bicycle is a wonderful way to travel! it is indeed a perfect object. You captured it well. Thank you Bea, I really appreciate it! Nice! Were you tempted to go for a ride? I hope it was something interesting like a container of gelato! This picture speaks to me. I have a fondness for bicycles, and I like how this one is built for practicality, with two carriers. Bicycles are personally very nostalgic, as they remind me of my Dad, and the European setting here reinforces that. I’ve always liked bicycles too and I thought that this one looked like it would be fun to ride! You are absolutely right,Meg.It looks as if it’s part of the deco there.I so much like the vintage look of the bicycle ! Have a nice and creative week. It does blend in well with the scene, a layering of different shades of grey. It looked so interesting that I had to take a picture – I’m so glad to have noticed this scene! You certainly have an eye for photographing the typical and making it look like a work of art. Just as if it was telling its own story. Isn’t it amazing how an everyday object can be such an inspiration and change an average scene into something special? You have a great eye, Meg. Thank you! I had been admiring the colorful pottery displays at the local shops and then I saw this bicycle. It looked just right for one of my souvenir postcards of Orvieto! I do like this photo very much. Typically you show a lot of color and I gravitate towards bright colors, but these, muted and blending into one another, really create a lovely effect. Ordinary objects, but a really nice photo, not to be overlooked!